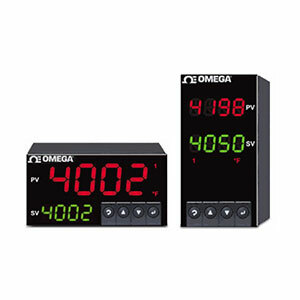 The OMEGA™ CNi8DH and CNi8DV are high-quality, highly accurate single loop autotune PID temperature and process controllers for 1/8 DIN (92 x 45 mm) horizontal or vertical panel cutouts. Both devices feature the same state-of-the-art technology, uncompromising accuracy, and quality backed by an extended 5-year warranty. The CNi8DH and CNi8DV are simple to configure and use, while providing tremendous versatility and a wealth of powerful features. The CNi8DH and CNi8DV come standard with your choice of 2 control or alarm outputs in almost any combination: solid state relays rated at 0.5 A @ 120/240 Vac; Form "C" SPDT relays rated at 3 A @ 120/240 Vac; pulsed 10 Vdc output for use with an external SSR; or analog output (0 to 10 Vdc or 0 to 20 mA) selectable for control or retransmission of the process value. The universal temperature and process instrument (CNi8 models) offer a selection of 10 thermocouple types as well as 2-, 3- or 4-wire RTDs, process voltage and current. The CNi8DH and CNi8DV are ideal controllers for use with transmitters and amplified transducers. Built-in excitation is standard (24 Vdc @ 25 mA). The units handle 0 to 20 mA process current and process voltage in 3 scales: 0 to 100 mV, 0 to 1V, and 0 to 10V. As with all iSeries devices, the process value display can be programmed to change color between GREEN, AMBER, or RED at any setpoint or alarm point. The LEDs displaying the process value on the CNi8DH (horizontal 1/8 DIN) are the largest digits of any 1/8 DIN controller. The strain/process instrument (model CNiS) meters and controllers measure inputs from load cells, pressure transducers, and most any strain gage sensor. Input ranges include 0 to 100 mVdc; -100 mVdc to 1 Vdc; 0 to 10 Vdc in addition to 0 to 20 mA. Excitation for transducers of 5 V and 10 V is standard. The highly recommended networking and communications options include direct Ethernet LAN connectivity with an embedded Web server, and serial communications. The C24 serial communications option includes both RS232 and RS485 which can be selected from the menu as well as a straightforward ASCII protocol. The C4EIT option includes both Ethernet and RS485 ASCII on 1 device. The iSeries, with the network options, are designed for easy integration with popular industrial automation and control programs as well as Microsoft Visual Basic and Excel. OMEGA™ provides free configuration software which makes it fast and easy to get up and running with many applications. Available for download off the Internet. Below are examples of common part numbers. Use the Part Number Builder below this table to choose your exact configuration. 注: 1. "-DC", "-C24", and "-C4EIT" not available with excitation. 3. "-SM" option not available on CNiS strain models.